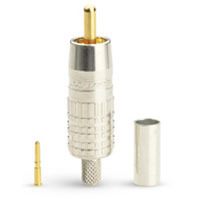 Canares new 75-ohm type RCA Video Crimp Plugs are impedance matched and total Canare Quality. Achieve outstanding analog and digital electrical performance with a usable bandwidth to 200MHz when matched with precision 75-ohm coaxial video cable. Great for Multimedia Patchcords, Hi-Res Video Monitors, SPDIF Digital Audio, Duplication Decks, VCR & Camcorders, Audio Interconnects. 75-ohm construction: Crimp Pin & Sleeve. Gold Plated Center Shaft. Gold Plated Contact Pin "Snap Locks" into place, preventing pin migration. VSWR less than or equal to 1.1 DC to 200MHZ. EASY FAST Assembly. Just 1) strip back the cable 2) Crimp on the center pin 3) Snap-lock the pin with cable into the RCAP body 4) Slide up the sleeve and crimpà thats all there is to it! Use standard Canare Crimp and Strip tools. For use with Belden 1694A, 9116, 9066, Commscope 2227K/V, 2229V.